Akshaya Patra Event-Outride Hunger 2016! Home » Media Room » Events » Outride Hunger 2016! Akshaya Patra's bike rally to spread awareness about the need to eliminate classroom hunger, ‘Outride Hunger 2016’ was held amidst much fanfare on 7 February, 2016 in Bengaluru. The rally was flagged off from Akshaya Patra’s HK Hill kitchen in Rajaji Nagar by the Additional Commissioner of Police, Bengaluru, Dr. M.A. Saleem in the presence of veteran biker, Mr. R. Chakravarthy, and popular Sandalwood actor, Krishna Ajai Rao. In fact, the actor even joined the bikers for a short distance before he had to leave because of prior commitments. The convoy of over 300 bikers then made their way through Malleswaram, Race Course Road, and Lalbagh Road, all the way to Akshaya Patra's Vasanthapura kitchen at Kanakpura Road. All along the 24-km route, they caught the eyes of passers-by, thus promoting a cause for which The Akshaya Patra Foundation has been working for over 15 years. Participating in this rally were individual bikers as well as bikers from renowned biking clubs like the Royal Indians - Enfield Owners Club (RIEOC), Highwaymen, Free Spirits Motorcycle Club, Bajaj Avenger Club - Bengaluru, Biking Buddies, Bikers of India, etc. Such was their enthusiasm that they had started to pour in by 7 o’clock and their eagerness to hit the road was palpable. The roar of bikes, as they proceeded towards the destination was music to the ears, more so, because they were riding for a cause. Before the flag off, the bikers were addressed by all the dignitaries. First, Sridham Krishna Dasa of The Akshaya Patra Foundation traced the organisation’s journey; how it began, how they spread to ten states across India, and how the number of beneficiaries has grown from 1,500 to 1.5 million over the course of time. He was followed by Dr. M.A. Saleem, who drew comparisons between serving children and serving God. He also spoke at length about our life being reasonably good and why it is important to improve the lives of children, i.e., our future generations. Krishna Ajai Rao, or Sandalwood Krishna that he is popularly known as, explained how hunger results in evil—pushing a person towards a life of crime, and how nutrition makes one a better person. He also praised the bikers, calling them the ‘real heroes’ as they had come out in support of this important cause. The participating riders didn’t just help in spreading awareness, but also had their fair share of fun. Not surprising therefore, was the fact that many of them were full of praises for the efforts put in by Akshaya Patra and Wrangler in making this rally a success. 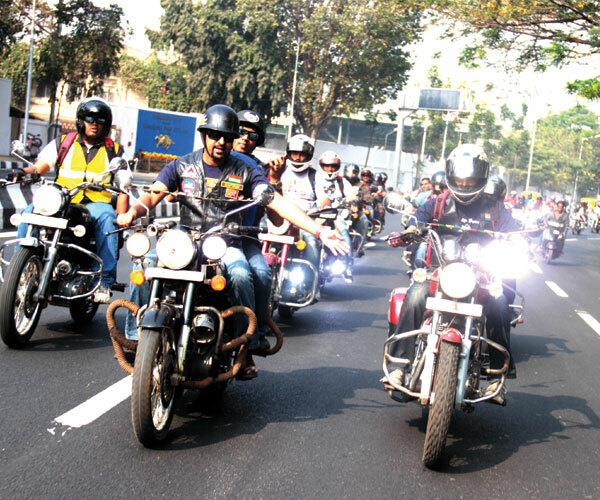 Lohith Mohan of the Royal Indians - Enfield Owners Club, who had also participated in Outride Hunger 2013, said that the organizing part was superb. Many riders expressed their astonishment about the fact that Akshaya Patra was reaching out to 1.5 million children across ten states and said they would like to do more to help. While some like Shwetha Rao, who was pleasantly surprised to know how Rs. 750 can help a child for a year, said, she would put in a word for Akshaya Patra at her workplace; others like Praveen V from the Highwaymen said they will definitely come forward to help as a group. Everyone present was univocal in lauding Akshaya Patra’s remarkable work and expressed their solidarity to the organisation’s cause. Rest assured if Outride Hunger 2016 was to go by, there is no dearth of people who would like to come forward and help the underserved.